Despite a 3-2 UCLA victory in Sunday’s first game that forced the if necessary, the resilient Gators rocketed to a 9-0 lead in the first inning of game two with just one out, snagging six stolen bases alone in the first frame, as seven straight batters reached base, including two hits each from junior Michelle Moultrie and Aja Paculba. Florida downed defending national champion UCLA, 11-3, in five innings for the second time in as many days to advance as the Gainesville Regional Champion. Florida improved to 50-10 on the season, marking UF’s fourth all-time 50-win season (2007, 2008, 2009). 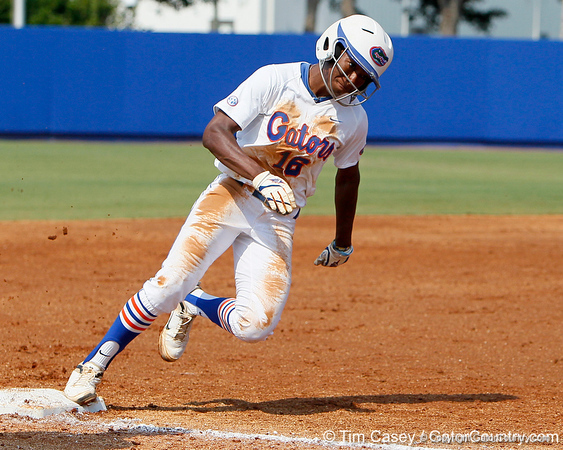 On the weekend, UF eclipsed several school records including team season records for runs scored (445) and RBI (419). Paculba took possession of Florida’s career hits record (273) and career stolen bases record (66), while senior Megan Bush took sole possession of UF’s career RBI mark (75). UF was a staggering 25-26 on the base paths over 2011 Regional play, elevating the squad to 94-113 on the season. The Orange and Blue advance to their fifth straight Super Regional and improved to 21-16 all-time in NCAA Regionals, 35-24 in the program’s NCAA Tournament play. The Bruins early day win forced the if necessary Game 7, allowing the Gators an additional shot to advance out of the Gainesville Regional. Florida capitalized, playing its best ball against the Bruins this weekend. The Gators put up 17 runs and stole 21-of-22 bases against the Bruins in three games over the two-day span. Freshman Cheyenne Coyle led Florida Sunday, going 3-for-4 (.750) with three runs, three RBI, a homer and four stolen bases. Paculba wasn’t far behind, hitting 2-for-5 with two RBI and one run in Sunday’s games combined. Freshman righty Hannah Rogers earned all three decisions against the Bruins, going 2-1 on the weekend to improve to 32-6, while Stephanie Brombacher picked up the win against Bethune-Cookman to earn her 18th victory of 2011.